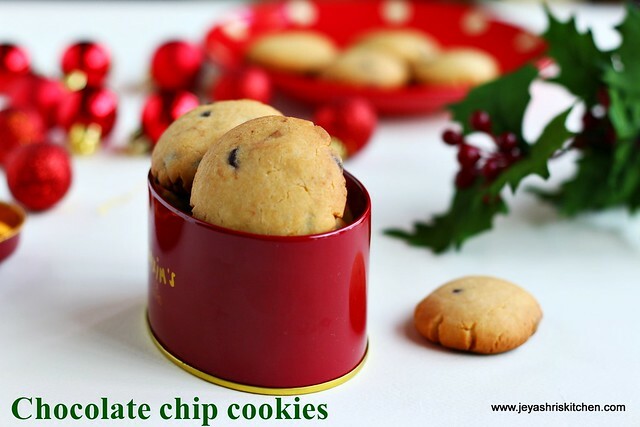 Christmas 2015 is nearing and i wanted to post this chocolate chip cookies for a long time. 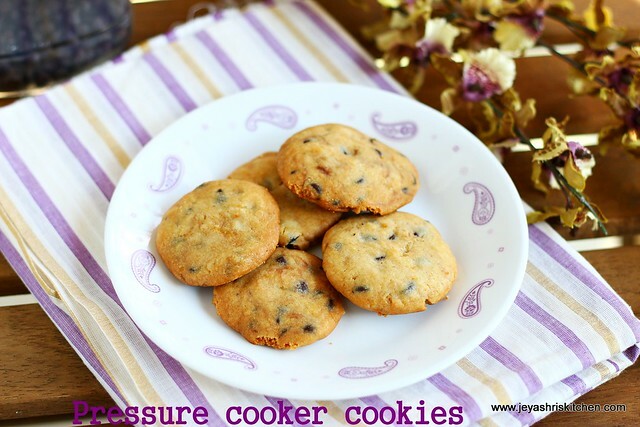 When i posted the pressure cooker cake ,many readers asked me to post pressure cooker cookies. Finally i tried this sometime back to post during Christmas. It turned out pretty well. In this recipe i have given both the option of making it in oven and pressure cooker. Feel free to drop in your queries to jeyashrikitchen@gmail.com. I am in Chennai right now with my family on vacation. Wish you all a Merry Christmas. In a bowl add the flour, baking soda and baking powder. Powder the sugar in a mixie. Add the soft butter to this. Keep the butter in room temperature for sometime, you will get it soft butter. Beat the butter and sugar mixture well. Add the milk, vanilla essence and chocolate chips to this. Mix well and add this to the flour mixture. Flatten it and arrange it in a greased plate or line the baking tray with parchment paper. Preheat the oven 160 degrees and bake it for 20 minutes. The original recipe mentioned 25 minutes, but mine got done in 20 minutes. Time varies from oven to oven, depends on the size. Let me explain about pressure cooker baking now. Refer my pressure cooker cake recipe for many tips there. Till kneading the dough and shaping them it is the same procedure. Take a big pressure cooker, let it be wide. Heat the cooker for 5 minutes on high heat. Do not use the black non stick cooker. Keep the stand which comes with the cooker into it. We don't need the gasket and weight for the cookies. If you do not have the stand, you can use a normal steel plate. Some people add sand below the stand, also you can spread slat too but i didn't add any. After heating this on high heat for 5 minutes simmer the flame to the lowest. Grease plate , choose a plate that fits into the cooker, but at the same time should not touch the walls of the cooker. 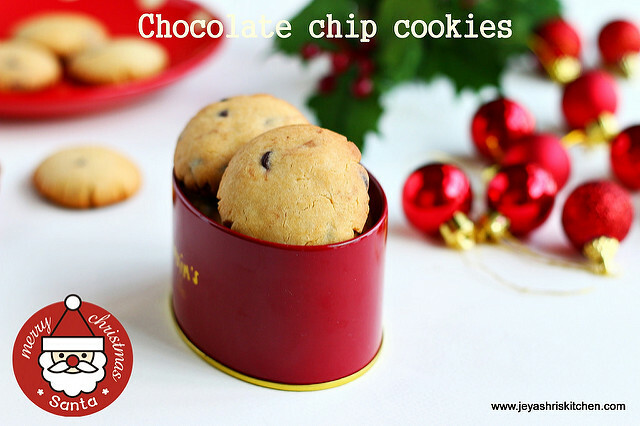 Arrange the cookies on the plate and keep it inside the cooker. Cover the cooker without lid without the gasket and whistle. Keep the flame very low and let this bake in the pressure cooker for 30 to 35 minutes. Even if you feel it is bit soft, allow this to cool for 10 minutes and will become crispy. But if you still feel it is soft after cooling down, bake for 5-10 minutes more. Unlike a cake, cookies can not be made in big lot. At a time 5-7 cookies can be done depending upon the size of the cooker. Baking time in cooker varies on the size of the cooker and the heat. You can choose any recipe from my recipe index and try the cookies. How many minutes should bake in simple electric round oven? Proportion of ingredients will change ? Proportion will not change. Timing i am not sure as i never used that oven.